Gosh here’s a real lesson in how to write a perfect scary ghost story for kids. 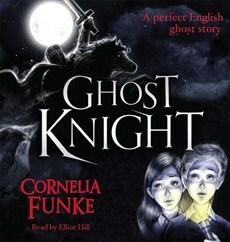 Cornelia Funke, not content with the success of Inkheart, has come up with an English ghost story that is bound to thrill any child who believes in ghosts and that’s a lot of kids! Poor Jon Whitcroft at the age of eleven is to be sent away to his dead father’s old boarding school in Salisbury. His mother has met ‘The Beard’ and despite all his desperate efforts to break them up, it hasn’t worked and Jon is to be banished from the family home. Boarding school terrifies him. Won’t know anyone, the food will be awful and he’ll have to share a room and he won’t get to see his mum and it’s all ‘The Beard’s fault. He is a very angry boy that arrives at his new school and is settled at the Popplewells in a small dorm of three. Whether it’s his anger or his despair that draws them in, but when he looks out of the window of the ancient house that first night he sees three ugly ghosts on horseback with bloodied swords and they let him know they have come to kill him! So begins the adventure. Of course his fellow dormers can’t see anything. But word gets out and gossip begins. Jon is tackled by a pretty but strange girl called Ella who wants to know all the details and doesn’t seem to be mocking him. Turns out Ella’s grandmother does ghost tours of the Cathedral. The next evening four ghosts appear and they swear to kill him and call him a Hartgill. Jon is terrified, but who or what is a Hartgill? Jon realises he is going to have to do some research to keep up with Ella. Ella doesn’t believe ghosts can kill anyone – but they could drive someone mad of course. Ella lives with Zelda, her grandmother who keeps toads in the house. Clearly mad as a hatter, but Ella seems very level headed. She decided they need help from the ghost of the knight Longespee, entombed in the cathedral. Jon goes along with it. He needs all the help he can get to fend off ghosts with bloody swords and hangman’s marks on their necks. The relationship between Ella and Jon is cute, but never coy. The ghosts are properly menacing and Jon gets away with murder, with all his absences, which would certainly never, happen at my old school. The illustrations by Andrea Offermann are wonderful and really hit the mark. Will Jon survive the murderous ghosts? Will Ella? Turns out the knight Longespee might be a lot more dangerous than they thought and what about ‘the Beard’ what secret is he keeping to himself? Read Ghost Knight and discover a frightening Salisbury you never knew.